Several of the adidas Skateboarding team travels to Japan to film for a new short film titled RŌZU. Have a look. Drop 1 of Real Skateboards’ Spring 2017 catalog reveals lots of unseen photos and rad product. All It Takes Is Just One Push… The newest release from REAL is now in skate shops worldwide with all new Spectrum Selects, In-Bloom series, the newest DADS x REAL editions, Kyle Walker SOTY boards, pro one-off decks from Ishod, Busenitz, Chima and Ramondetta, along with a first look at Justin Brock’s new ad and much more. Real Skateboards just released a Best of Busenitz: 3 Up & 3rd edit. Sit back and watch him destroy two of his favorite SF spots over the years clip by clip. Rewriting how far back skating goes is a concept we as die hard skateboarders definitely can get behind. 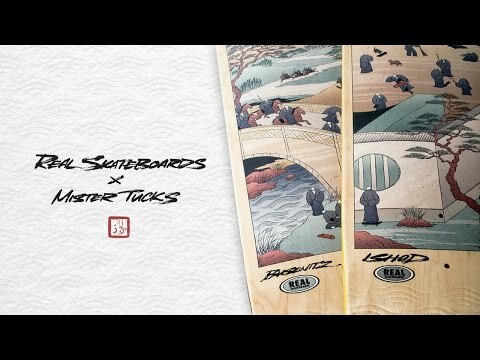 From his studio in Singapore, Mister Tucks rewrites skating’s history for a new collaboration with Real Skateboards featuring Dennis Busenitz & Ishod Wair Pro Decks and Temple of Skate Apparel. Getting the chance to work with him on these two boards and tee was nothing short of awesome for the Real crew and they hope you enjoy them and that they open Mister Tuck’s work up to the audience he deserves. Embossed wave patterns only on the nose and tail, full color screen on top, and a poster with each. Real Skateboards’ new video piece titled Surveillance #01 just went live with Peter Ramondetta. This barrage of sick footage also includes Dennis Busenitz, Ishod Wair, Ernie Torres, and Zion Wright. Dig in!